The screen will occasionally turn to garbage (see attached) crashing the computer and sometimes it stays that way even after several resets. Other times the screen will turn right back to normal but the computer will stay locked up and need a hard reset. SSW is Lion and up to date although I'd love to downgrade to Snow Leopard to get Rosetta back. Thank you for the input. I'll try cleaning the vents and moving the computer to a more open area for better airflow. I get a similar view to yours, but with a lot more red, on one the DVI ports on my PC. There's a problem somewhere close to the video port that I haven't been able to track down. I'm reluctant to do anything about it, since the other ports work, and it's otherwise a good card. If you don't get any satisfaction from checking RAM and dust-bunny removal, I'd suggest looking at the video subsystem. Are you able to test video on an external monitor? Having repaired several Imacs that all had the same problem, I'd suggest you inspect the electrolytic caps in the power supply and main board. If any are bulging or have blown, that's the likely problem. Keep in mind that replacing them isn't always easy. It can take a LOT of heat to melt the solder Apple used. I have many temperature controlled Weller irons and needed to use a 100/150w soldering gun to melt their solder. Also on one Imac I noticed that the heatsink fastening clip on the CPU had broken and the heatsink wasn't fully on the chip. ...which is why I inferred he should first try the RAM and check the cooling as you'd suggested. Remote-diagnosing systems based on someone's post online is difficult, and there's no harm in offering another option if the first one doesn't work. I also agree with the subsequent post of checking the board's caps as another option. I didn't mean to imply that the video card wasn't overheating or there was any other problem(s) present. 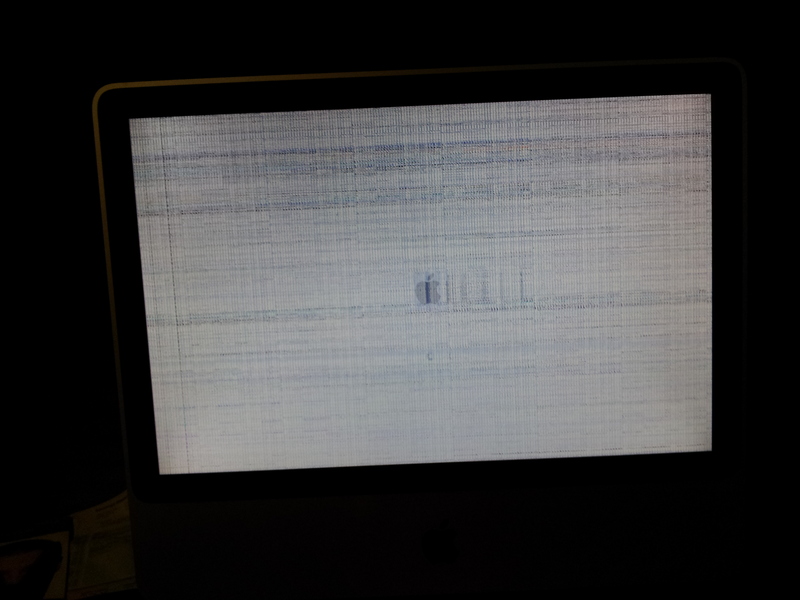 On my own Imac, the video card did the same thing. However the reasons cards heat up more where they didn't previously is usually due to increased AC ripple (bad caps) or dust. Before anyone attempts a component level repair, I wholeheartedly suggest they open their unit and blow out the dust. Also, I was able to obtain a little longer running time before lockups by installing smcFanControl. With it, I was able to boost the airflow and keep things cooler. Of course boosting fan speed also boosts current draw which increases heat and destroys caps, but at least in my case it helped buy a little time. Apologies, Neon Forests, I was replying to SpeedyG's post up above, and didn't use the right reply button. My bad. I fully agree caps are a good thing to put on the checklist. They're the most frequent culprits in the LCDs and motherboards I repair. Thanks everyone for the replys. Well I installed smcfancontrol and cranked the fans up. The hottest the cpu read was 120°F and it was fine for a couple days. Now it has taken a turn for the worst and the problem is constant. Single user mode does not crash even though there is garbage on screen 99% of the time. Ram testing revealed no issues...so I think this means a failed cap? if the mistake turns to become constant and its not dependent to temperature the option points to the components itsself - and among the components themselves the electrolytic capacitors are the first choice for hunting. or the second "wide-shot" if the related caps can´t be spotted out by appearance to exchange on doubt all caps in the related videoarea and along the powerlines ( thats a really timeeating and expensive task - so a careful inspection might save some money and time - but sometimes the caps really die without a change in the appearance and the "wideshot" can´t be avoided. In case of replacement of the caps there is one rule : if value can´t be replaced exactly the replacement cap should never have smaller values than the original one - and always ensure to keep correct orientation of polarity - otherwise they might blast like firecrackers ! In case of doubt mark the orientation at the PCB with a markerpen ! Capacitorvalues are displayed by : value/voltage (i.e. 47µF /16V = 47 microfarady/ 16 Volt volt Limit ) so such a cap may be replaced with a cap like 68µF / 16 Volt or 47µF / 25 Volt. ... but its best to keep up with the matching same values ! Some companies mark only the positive pol with a "+" sign and some companies mark the negative pol by a kind of line on one side. Well I am only a novice at soldering but I'll try repairing it anyway. First I'll put togethor another computer and see if I can't back up the imac hdd in target disk mode. Thanks for your help. What I did find when I took it apart was the large heat sink was clogged with dust. All the caps on the board were solid and saw no bulging tops even on the paltry 180w power supply. Since the heatsink cools both the GPU and CPU one of those is probably heat damaged but both look removable. I'm surprised there is no emergency shutoff to prevent overheating like previous imacs. I'll see if clearing the heat sink stabilizes the computer and if not start with the AMD card.